buddha figur stående click In my last post I told the story of my adventures in mud on the way to my grandfather’s funeral in March. Well, my grandmother gave my sister and I some of Granddaddy’s tennis racquets. The one I was given had a wood frame around it to keep it from twisting from the force of the strings, and it is probably around 40 or 50 years old. sonos eller heos I arrived at the airport about an hour before my flight, but when I went to the counter to get my boarding pass I was informed that my flight is delayed. Also, since I only had a carry on, I couldn’t fit the racquet into the suitcase, so the racquet had to be my carry-on and I had to pay $25 to check my suitcase. The gate agent felt sorry for me and upgraded me to economy plus. http://rockreach.space/2018/08 gypsy netflix review Anyway, I had so many random conversations with people because of that racquet. 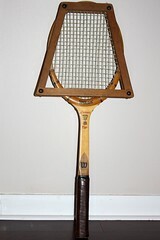 Most of them were older folks who remembered playing tennis with a racquet like that when they were kids. I know I must have looked rather strange with that thing, riding the transit system and placing it carefully on the seat next to me where ever I was. museum radio kootwijk openingstijden there I am lucky to have a lot of paintings that my grandparents created, but I don’t have a lot of personal items from them, and it felt nice to have that racquet with me, almost a companion in my travels. Sarah is so completely rad. lévis usine center Wait… I played with a racquet like that when I was 10-ish. Does that make me old? It was originally my grandfather’s, I think. I found it in a closet.